Love our sticky honey lime grilled chicken? 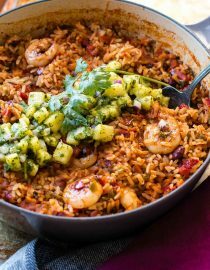 This one pot sticky honey lime shrimp with pineapple chimichurri took me only 20 minutes and might be even better! This post is sponsored by our sweet friends at Knorr but all opinions are our own. 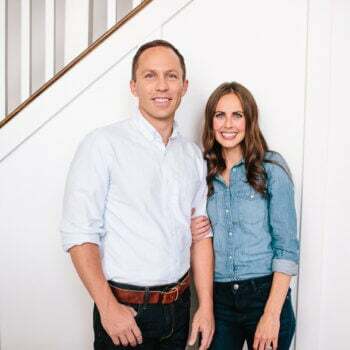 Remember a few weeks ago how I got super personal and told you all about how we first turned this blog into a business all because we were going through a period of unemployment and that it was Knorr that totally changed our lives? Plus there was that awesome cheesy chicken and rice casserole which is still one of my favorite recipes ever created. But, I’m getting distracted, we are back with another new recipe and Cade says it’s his new go-to meal since it’s a quick and easy seafood dinner idea! 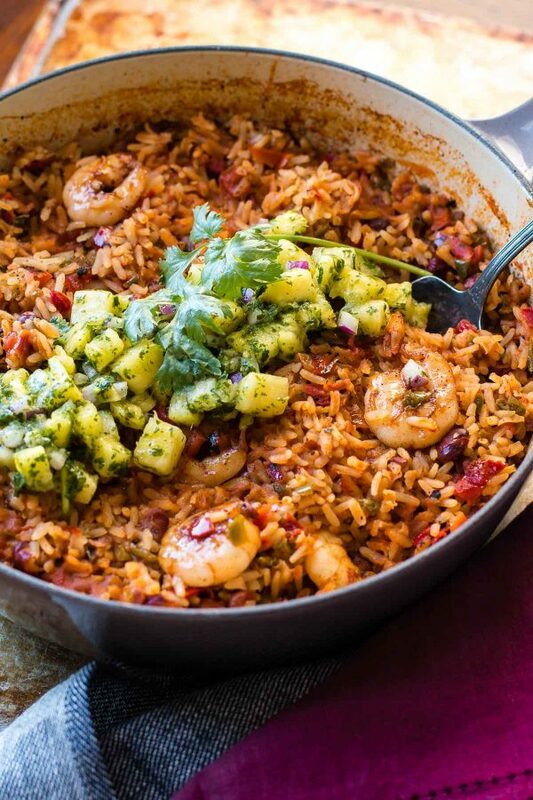 Yay for one pot sticky honey lime shrimp with pineapple chimichurri! Is Shrimp High in Protein? They’re protein-rich. … Three ounces of baked or broiled shrimp provides about 20 grams of protein, just a few grams less than a 3-ounce chicken breast. 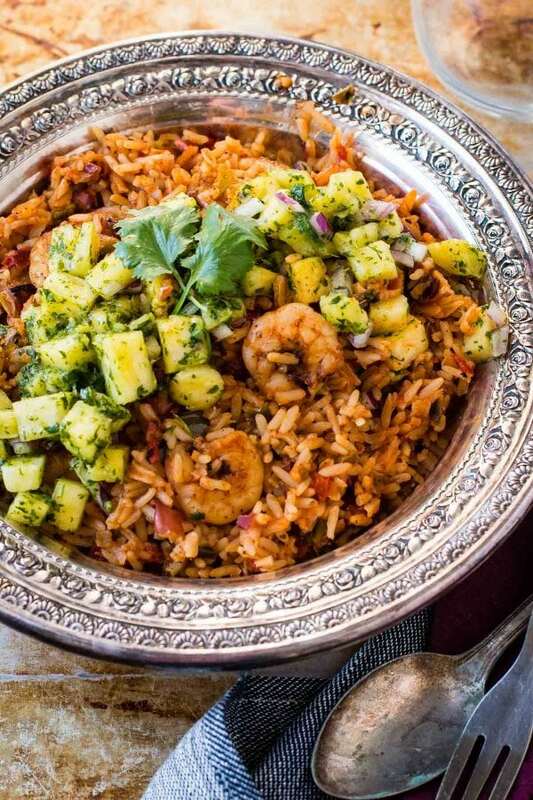 I double dog dare you to say that ten times fast, one pot sticky honey lime shrimp with pineapple chimichurri, phew!! Cade says we should just call it sticky shrimp and rice, but then you don’t get the full story on the flavors! Typical man vs woman thing, he wants to get to the point and I want details. You’ll notice that there are numbers on shrimp packaging, fresh versus frozen shrimp and cleaned, deveined, peeled or unshelled, and raw shrimp when you go to buy it. If you’re Cade you’ll buy whatever is freshest in the store. If you’re Carrian, who has got some major issues with cleaning shrimp, you’ll buy the frozen, raw, cleaned shrimp. All this means is less work for you, so if you’re not into deveining stick with her. What do The Numbers Mean on Shrimp? Don’t worry, I wasn’t going to leave you hanging. The numbers refer to how many and how big the shrimp are in a pound. You may think the bigger the better if you’re a shrimp lover, but in fact there are situations when smaller are better like in a dip or salad. For this dish, we chose a 21/25, meaning there are 21 to 25 shrimp in a pound, so they aren’t tiny, but they aren’t big like a U/10 would be. 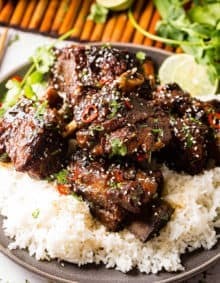 If you’re a little unsure of yourself in the kitchen and want to know the easiest meat to cook, (can you even call seafood meat?) I’d for sure start with shrimp. While they can easily be overcooked they are also the easiest to see that they are done since they appear pale white and pink once they are ready. Really, it’s such a fast dish too as you only need 4-5 minutes, or even less if the shrimp is smaller. There are a lot of one pot meals out there, but I’m sure you’re like me and have quickly realized that not all one pot meals turn out very good. If you want to know how to make one pot meals you have to first start out with your meat or veggies. The best one pot meals, in my humble opinion, are those that have you cook something in the pan with spices first, and then add the liquid and grain or carb of choice. This creates what we cooks call, the fond. We will get to that in a bit. Add a little oil to the pan and cook the meat, veggies or even just bloom the spices and then move on to the rest of the dish. 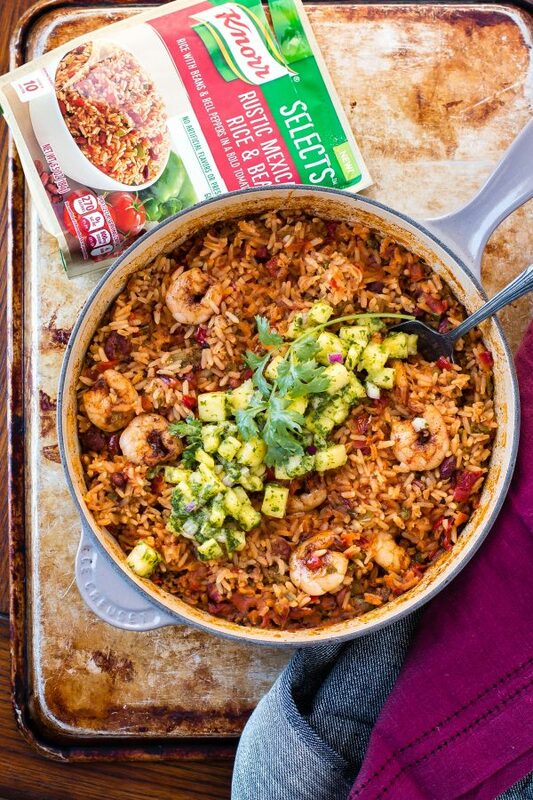 Really, if you always want to be successful, use ingredients like Knorr Selects because the rice will cook with the liquid already in the pan and they are incredibly well-seasoned, so it won’t be bland like other Pinterest recipes we’ve tried. 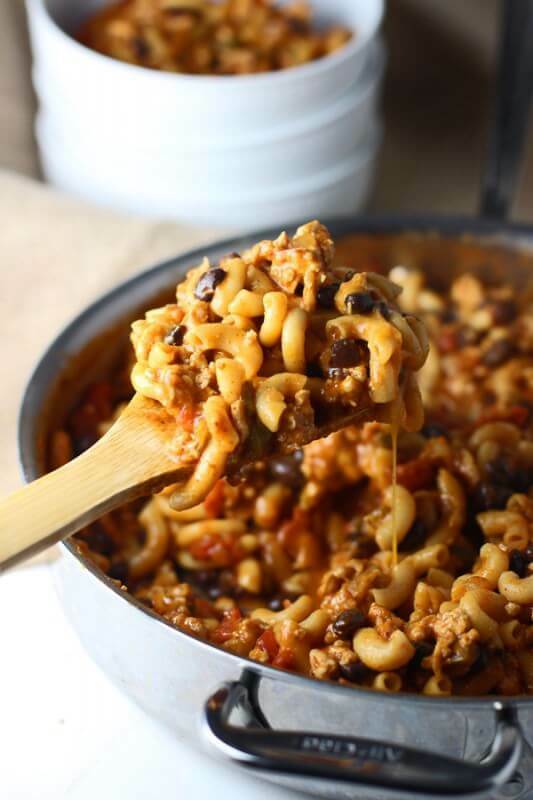 Knorr Selects are so great to use for one pot meals since they come in six totally unique flavors that you can use for anything you’re craving. They don’t have any artificial preservatives or flavors and they are gluten free which makes preparing dinner for family and friends even easier. What is Fond in Cooking? Fond is really just a fancy word for base. It’s all of the caramelized brown bits in the pan after you’ve cooked something. This is especially delicious if you’ve used meat or spices as they give off even more flavor. In fact, if you put your spices in first before making a soup or one pot meal it’s actually called blooming the spices, or in other words, opening them up so you get all of the flavor they have to offer. The fond is all of that flavor leftover in the pot and it totally enhances the dish. Really, once you get experimenting with one pot meals you’ll be hooked. Summer is such a crazy time for our family. 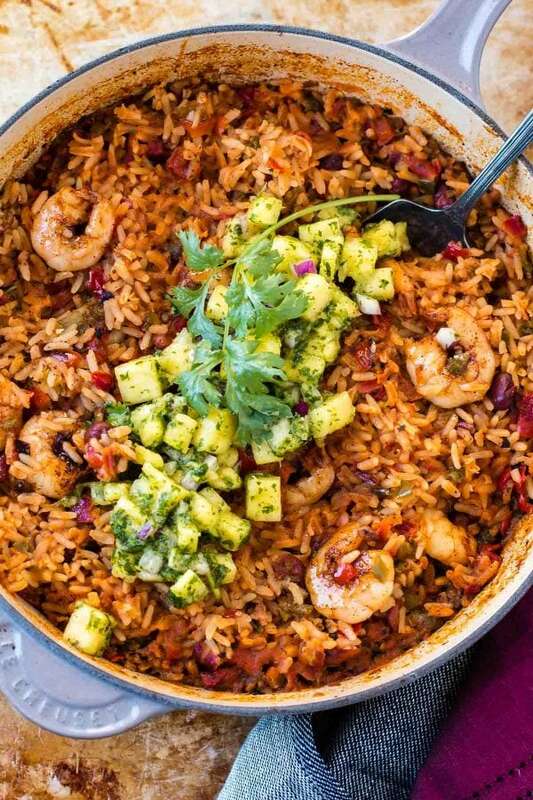 It’s not even that we are off to the beach and vacationing every day, but summer is a time when the kids don’t have a regular routine and random things come up so having a dish like this one pot sticky honey lime shrimp with pineapple chimichurri is such a life saver. We even throw leftovers in tacos the next day, two meals from one! Pssst, before we go, you can get coupons for the Knorr Select right here. You’re welcome! For the Rub and Sauce please use our link above. Combine the rub ingredients and toss the shrimp in it until well coated. Heat a pan to medium heat with a drizzle of extra virgin olive oil. Add the shrimp and peppers once the oil is hot and cook for 1-3 minutes or until the shrimp begins to turn pink and flip each piece over. 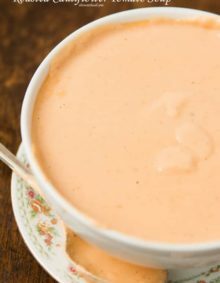 Cook for an additional 1-3 minutes or until completely pale and pink. 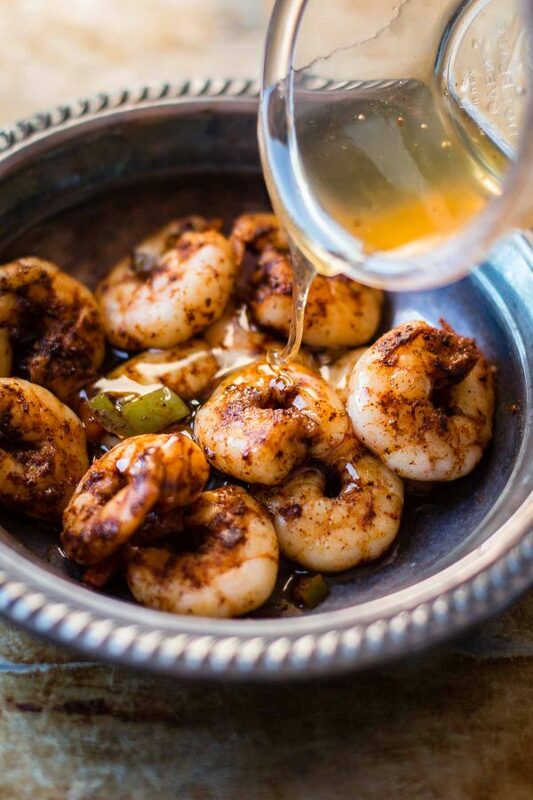 Remove the shrimp to a small bowl and drizzle with a few tablespoons of the sauce, leaving the peppers in the pan. Quickly add the rice and ingredients listed on the package. Cook the rice per package directions, adding the shrimp back in for the last 5 minutes of cooking. 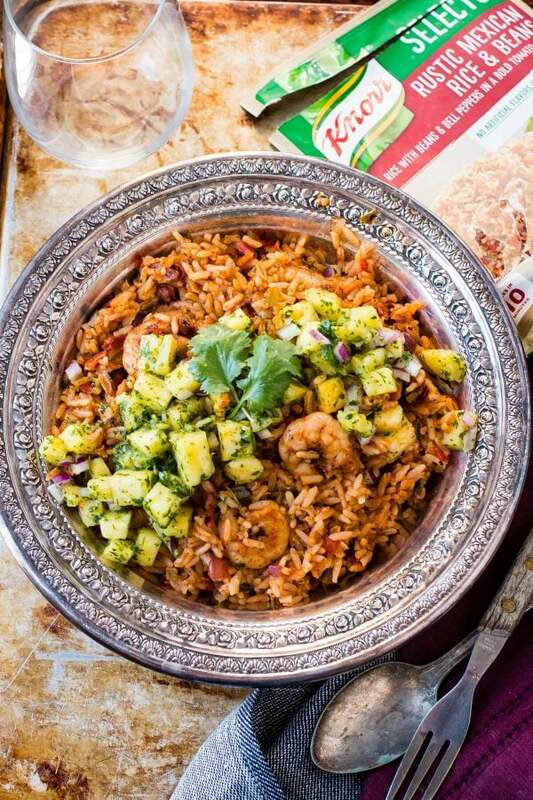 Serve the shrimp in a bowl with a drizzle more sauce and the pineapple chimichurri. Meanwhile, place the cilantro, olive oil, lime juice, salt and pepper in a blender and pulse until well combined like a pesto. Remove to a bowl and toss with pineapple and red onion. Now you’ve got dinner covered without feeling guilty! Help! 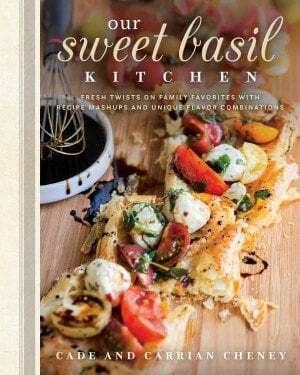 I want to make this tonight and it says please use link above for run and sauce and I can’t find any link above? 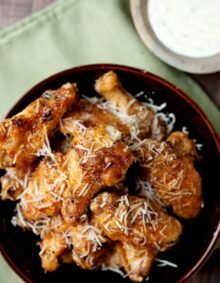 Can someone help w/ingredients for rub and sauce? Thanks!